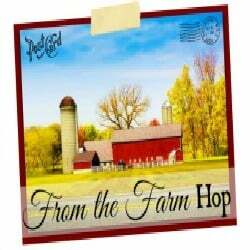 Every Friday I co-host with the other ladies from the From the Farm Hop. It’s brought so much information and new ideas for our mini farm and our homeschooling. Learning how to garden, raise animals and provide diy healthy food is both nourishing to the body AND the mind. Public schools are raising funds to grow gardens to help kids eat fresh healthy foods, interact with nature and relax as gardening is calming. I firmly believe that the increase in pesticides and antibiotic use in animal feed affects our children negatively. As a child and adult I have ADD. Actual diagnosed since a ADD…and I never “grew out of it.” Dr’s said to avoid food dyes and other additives in our foods and to take medication. Mom refused to do medication but she did make sure our foods were as natural as possible and tried to feed us the way we ate before moving to the city which is when my brother and I had ADD issues. With my own kiddos we follow an organic diet, raise as much of our own food and any time we eat out I can see how the additives and preservatives hurt them. If your kiddos have allergies, learning issues, behavioural issues or have special needs I highly encourage you to grow your own organic garden, raise your own chickens for eggs and/or look into connecting with local farmers by joining a coop like azure standards which delivers monthly organic goodies at conventional prices. So, even if you’re not into “farm life” take a gander and check things out. I know you’ll find some value within the hop. All of the hoppers are awesome but my favorite one is from Linn Acres Farm. I love that she came up with a no sew Hen Saddle! Brillant! We use to have a little hen called Ms. Neked because she was so picked on and as such was neked. She was just always picked on and was such a gentle momma. Well, the roosters would just go after her, the hens would go after her. Honestly, it made all of us want to clobber the others because no one would accept her into their group. People say kids on the play ground are vicious…but that’s because they’ve never seen chickens go after a hen. Anyways…if we had had something like this it probably would have helped her keep some feathers. I just asked the kids if we had pictures of little Ms Neked and the smiles that just popped up on their face and gave some giggles. Rhea said, “You know as many stories we have of her you’d think we would have taken some.” I guess sometimes life is too good to stop and take a picture. So Congratulations Linn Acres and to the rest of ya! Don’t forget to display your “I was featured on FTF Hop’ button on your blog!